Ready your teams for battle! We’re just a few days away from the full launch of Echo Combat, the latest expansion in Ready At Dawn’s critically-acclaimed Echo universe. 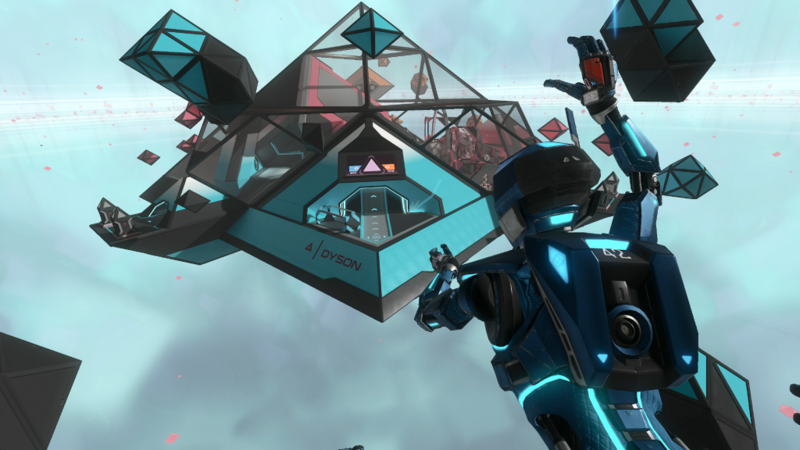 A new team-based shooter set in a zero-gravity environment, Echo Combat takes the award-winning mechanics from Lone Echo and Echo Arena and mashes it up with a fresh take on competitive gameplay. Echo Combat launches on November 15, but we’ve got plenty of new content to talk about today. 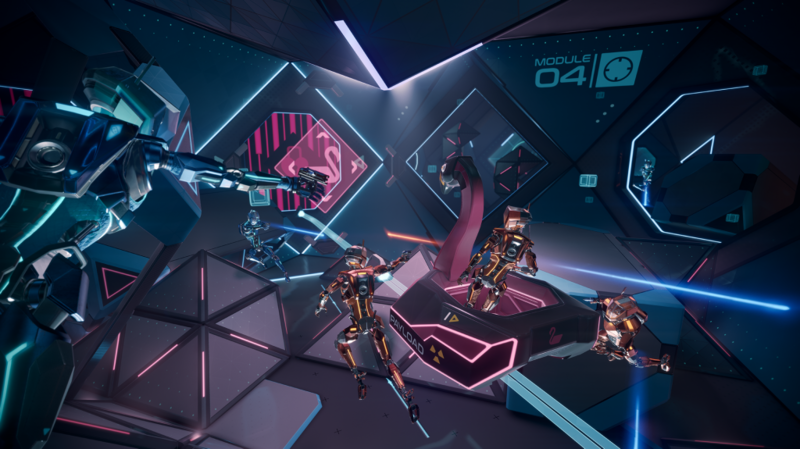 At Oculus Connect 5 in September, Ready At Dawn revealed additional details about Echo Combat, including another map, Combustion, as well as an additional game mode, called Capture Point. It also announced private matches and trophy-like achievements for Oculus Home, making your accomplishments that much sweeter. September also marked the end of numerous frag-filled public betas, which saw Echo VR community members battling it out for robotic supremacy. As for the new content, there’s plenty in store for long-time Echo fans and newcomers alike. First up, there’s a whole new map available at launch: Dyson. A massive open-space destination for Control Point mode, Dyson will treat players to new strategic opportunities including a variety of entry points to the map to help teams divide and conquer. There’s also an explosive addition to the Echo Combat arsenal called the Meteor, which acts like a classic rocket launcher; the perfect tool when you’re staring down enemies and you’re running out of options. Just as handy, and far less messy, is a grenade-like device called Instant Repair that heals targets on impact, including yourself. If you’re the kind of player that loves a good exit strategy, then the new Phase Shift ability is for you. Letting players phase out of reality for short periods, Phase Shift is a particularly useful TAC-MOD that’ll help you sneak behind enemy lines or make a hasty retreat. There’s also a new progression system in Echo Combat to help you keep track of your heroic exploits. You’ll gain experience by competing in public matches, gaining character levels, bragging rights, and access to a suite of new customization options, like decals, emotes, and patterns. Plus, once you’ve unlocked something in Echo Combat, it’s also available in Echo Arena; you can even review combat stats for both games at once, using your arm computer. Lastly, after months of serious play-testing, the default game size has been bumped up from 3v3 to 4v4—the more the merrier. Echo Combat will be available on November 15 as an in-app purchase through Echo VR for $9.99 USD. If you already own Echo VR, you can purchase the Echo Combat DLC on the Echo VR Oculus Store page. 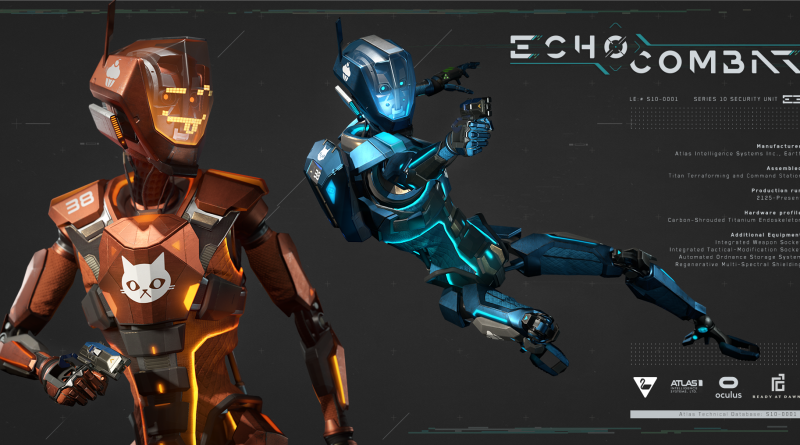 Echo VR players can also log in to Echo VR and purchase Echo Combat from the Main Menu or in the Echo VR lobby at any of the Matchmaking Terminals or Customization Terminals, confirm your purchase in headset, and you’re ready to take off into zero-g glory. Echo Arena will remain free-to-play and players can except Echo VR support from Ready At Dawn through 2019.